Usually when one thinks about finding ancient manuscripts we think of remote locations in the desert or in barely accessible mountain caves. But a recent discovery was made at Luther College when a student found nine fragments of papyri that are 2000 year old. It seems the papyri was purchased in the 1920s by a professor who then brought it back to the college. The professor died many years ago and the papyrus was in a cardboard box waiting be "rediscovered." Luther sophomore Brittany Anderson of Sparta, Wis. was examining the papers of the late Orlando Qualley, longtime professor of classics, the first vice president of Luther College (1934) and the first dean of the college (1946-64), when she came across the nine ancient documents among Qualley's letters and journals donated to the college in the 1980s. The papyri-one of which, a libellus, is especially rare-date from the first to the fifth centuries A.D. and were apparently purchased by Qualley from an antiquities dealer when he was part of a University of Michigan archaeological excavation at Karanis, south of Cairo, in 1924-25. Decius issued a decree that year ordering all inhabitants of the empire to offer a sacrifice to the gods as a show of loyalty. A libellus was a document given to a Roman citizen to confirm the performance of such a sacrifice. Christians were forbidden by their beliefs from performing these sacrifices and were thus subject to arrest, torture and execution for refusing to obey the emperor's decree. Pope Fabian was among those who refused to sacrifice and was subsequently killed by the Roman authorities. Decius issued a decree that year ordering all inhabitants of the empire to offer a sacrifice to the gods as a show of loyalty. A libellus was a document given to a Roman citizen to confirm the performance of such a sacrifice. Christians were forbidden by their beliefs from performing these sacrifices and were thus subject to arrest, torture and execution for refusing to obey the emperor's decree. Pope Fabian was among those who refused to sacrifice and was subsequently killed by the Roman authorities. 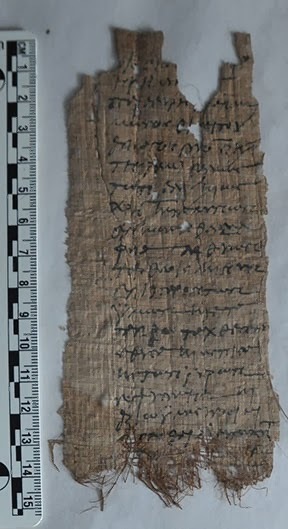 Several are accounting documents, but papyrologist Graham Claytor immediately identified one as a libellus dating from the first great Roman persecution of Christians beginning under Emperor Decius in the year 250. Here is a video link about the story.